Bottom Line: A super shady park nestled in the Woodlawn-Waycroft neighborhood. 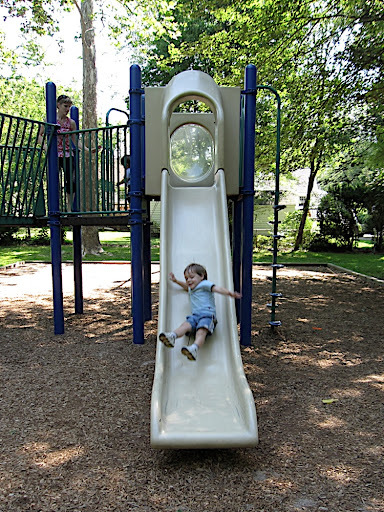 Equipment for big and little kids makes this a good destination for a mixed-age group. 4/5 stars. 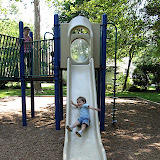 After visiting Woodmont Park, the boys and I headed over to check out another Arlington park. Woodlawn is tucked in the Woodlawn-Waycroft neighborhood, one block west of N. Glebe Rd. and one block north of Washington Blvd, adjacent to Capital Hospice. I had driven through this area before but never noticed any playground or park. That’s because it doesn’t have a well-defined entrance and is not visible from any of the bigger roads. There is a sign on Buchanan Street at N. 14th St. There is no parking lot, but I found ample street parking on my visit. The park can also be accessed from a few other side streets (e.g. N. 14th St and Abingdon St.), but street parking seemed more problematic. From the street, we followed a paved path that led us back to an oasis of green hidden behind the rows of houses. To our left was a half basketball court and sunny green field. To our right lay a wonderfully shady and pleasant playground area. There are two play structures, two sets of swings — 2 baby swings and 2 regular swings, a sandlot, and a water fountain (that wasn’t working). My 2 year old and nearly 5 year old were not bored and had fun on the various equipment. 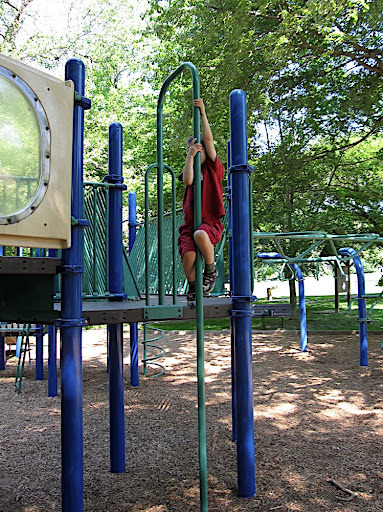 The fact that the park was well used was a plus – it meant new friends to play with, even if we did have to wait for a turn on the swings. 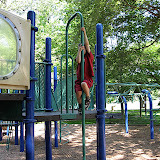 Overall, I thought this park was a wonderful find and will be a great place to visit on hot summer days. The paths around the park all seem to be paved, but I would not recommend this park for bike riding, because the paths would take bikers out of your line of sight pretty quick. The park is open green space, without any enclosed fences, so if you have a runner, this might not be the spot for you. But for us, this was a wonderful find that I look forward to returning to. Thanks for the catch Shaunel — I just made the update. I appreciate the kind words as well. Stay cool out there! Just wanted to say thanks!! Love your reviews! I have sent the link to many people & especially when friends move to the area. It’s such a great resource! This park has just been renovated!! Share your site (still) all the time! !